The idea of shrouded bodies in burial is an ancient one, and the natural funeral movement has folks requesting it again. But shrouds create more than a few challenges when it comes to respectful body-management. The Natural Burial Company created the SHROUDING BOARD™ to provide secure and dignified transport for those who use shrouds, whether in the home or chapel, and during conveyance to the cemetery or crematory. Designed with the needs of both the family and funeral service providers in mind, our artisan-made SHROUDING BOARD™ is compatible with standard casket-lowering devices, slides on crematory or hearse rollers, as well as being easily hand-lowered. 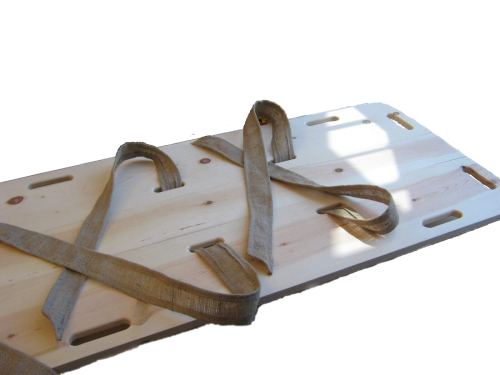 With handholds on both the ends and sides, it can be easily carried by either two people during preparation, or 4-6 people during the walk from vehicle to grave. The interior slots and straps allow the shrouded body to be tied firmly to the board, preventing awkward slips or other movement while carrying. The SHROUDING BOARD™is made of #3 knotty pine "off-cut" planks and fitted together with "animal-free" glue and wooden dowels. There are no metal fasteners or parts. The straps are heavy-duty jute fabric seamed with cotton thread. Curved ends and well-sanded handholds soften both the appearance and touch. Runners on the bottom complete its versatility. It's dimensions are 24" wide by 80" long by 3" deep.